United Nations Children’s Fund (UNICEF) Special Olympics Ambassador, Lucy Meyer (centre), is embraced by Chief Executive Officer of the Digicel Foundation, Samantha Chantrielle (right), while Mayor of Montego Bay, Councillor Glendon Harris, looks on. The occasion was the recent official opening of a centre of excellence at the Montego Bay Learning Centre in Catherine Hall, St. James. United Nations Children’s Fund (UNICEF) Special Olympics Ambassador, Lucy Meyer, believes that youngsters with intellectual disabilities are capable of having normal lives if given the opportunity. “It makes me sad when kids cannot go to school, cannot play sports, and cannot do things that kids like to do. I want UNICEF to make it so that kids with disabilities can play, learn and have fun just like kids without disabilities,” she stated. The 17-year-old resident of Los Angeles, California, USA, who was born with cerebral palsy, said she was an example that children with special needs have the ability to make a difference in the lives of others. 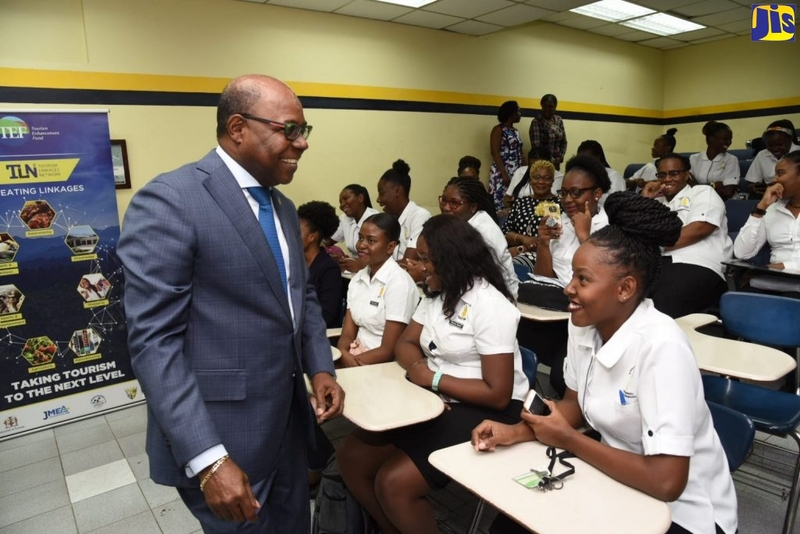 She was giving the keynote address at the recent opening of a centre of excellence at the Montego Bay Learning Centre in Catherine Hall, St. James. Ms. Meyer highlighted her role as Global Messenger for the 2015 Special Olympics World Games in her home city, which attracted 7,000 athletes from 177 countries for nine days of competitions. The event was the biggest to be held in the West Coast city since the 1984 Summer Olympics. “Throughout that time, the focus was on the Special Olympics athletes who showed the world that people with disabilities (can be) accepted,” Ms. Meyer pointed out. She noted, however, that in many countries, persons with disabilities are marginalised and underscored the need for this to change. “People with disabilities should be able to feel like they are valued in society just like people without disabilities. The 2015 World Games went a long way in changing that perception and I was happy to have played a role,” she added. Ms. Myer, who is also the Official Spokesperson for the Special Olympics/US Fund for UNICEF Partnership, has been competing in the Special Olympics for four years. She has won 13 medals to date, while using the sporting platform to raise global awareness about children born with disabilities and special needs. Over the past three years, Ms. Meyer has taken her message to high-ranking US officials, including President Barack Obama as well as numerous senators and members of Congress. She was a featured speaker at the preview launch of UNICEF’s 2013 State of the World Report on Children with Disabilities at the Capitol Visitors Centre in Washington, DC. Ms. Myer’s website has raised thousands of dollars to support children with disabilities, particularly in developing countries. Data show that, globally, an estimated 93 million children under the age of 15 have a disability. Ms. Meyer, who indicated that her trip to Jamaica was “wonderful”, anticipates returning for an extended visit. The centre of excellence at the Montego Bay Learning Centre is the ninth to be opened for children with disabilities by the Digicel Foundation in collaboration with the Ministry of Labour and Social Security. Additional support for these facilities is provided by the Ministry of Education, Youth and Information, and the Jamaican Association on Intellectual Disabilities (JAID).